Italicized quotations throughout are from my old raid leader Sebudai, well-known for his efforts to teach his raiders to be better at playing WoW. I’ve written many WoW guides over the past years, largely covering the details of min/maxing a particular class, but I always knew I was addressing a narrow slice of what makes a good raider. While there are reasons that players who know the nuances of perfectly optimizing their class’s output and ability use are prized, even they are no substitute for a raider who excels at the most important skill of all: not dying. Volumes have been written on how to do good DPS, healing, or tanking. If you raid or want to raid at an intermediate or high level, I imagine you have long immersed yourself in that discourse already. 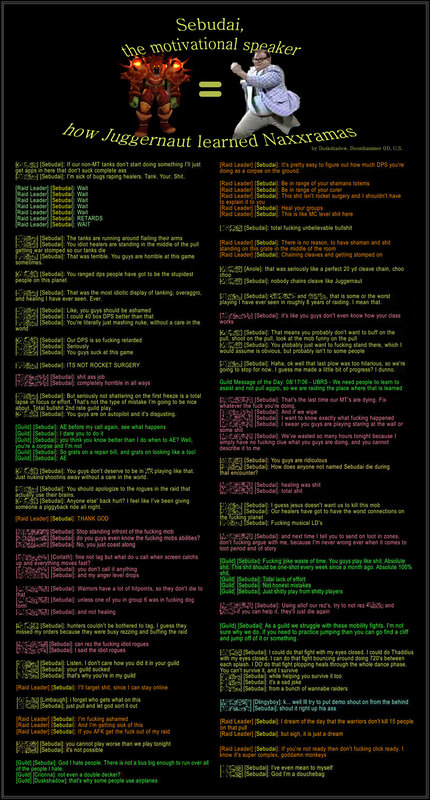 There are many reasons why existing WoW guides, forums, and discussions are largely about optimizing those roles. They are the primary way players are measured by themselves and by raid groups. Large parts of them can often be solved with math, leading to simple and easily implemented results. But most important, I suspect, is a widespread impression that I hope to refute in this post: that your awareness and survivability in raids is a part of who you are as player and cannot be changed. After outlining the basic premise that not making avoidable errors that kill you or other raid members is an area of play you should seek to improve, the bulk of this post is about specific things you can do or practice to accomplish that. Through the survey of techniques discussed—gearing your UI towards awareness, being more cognizant of your encounter routines, and constructive behavior post-wipe—what I most want to convey is a mindset. I couldn’t list out all the factors in the mental game of raiding even in much longer post than this. But if you adopt the ethos that every death is a puzzle to be solved, that somewhere in series of events leading to it is a decision you could have made better, you can train yourself to look for it. Dark Souls can be pretty intimidating for new players, and I’ve seen various lists of tips for people just starting out. I wanted to try writing one which was thorough, but with a balance of clarifying things that unnecessarily confusing while leaving it up to players to explore and play how they want. Now seemed like a good time, as I’ve seen friends say they were trying this game after all my recent raving about it, and also the recent Steam sales and people playing it in advance of the sequel. The goal isn’t just “before you get started” tips, but also to have a place to get descriptions of mechanics/systems that people are likely to ask about before they know the game well. This post should tell people how some things work without telling the player which options to pick. Figuring out what to do the first time is one of the great parts of the game, but my opinion is that works a little better when people can understand what their options are and what their significance might be. In short, it’s the guide I would have wanted to have handy when I started playing. A controller is recommended. I could see learning the game with keyboard/mouse if you’re really nimble with a keyboard/mouse, but it probably adds more to the learning curve in a game where that’s not required at all. The biggest obstacle is that the in-game UI references only controller buttons so you’ll have to memorize the various mappings on your own. DSFix is a crucial mod that fixes some basic issues like resolution and framerate caps. It also adds frequent auto-save backups, which can be handy in the event that any bugs or encounters with hackers in multiplayer cause problems with your save file. If you can’t get the game to start when you first try it, it’s probably an issue with Games For Windows Live. There’s no one exact solution, but googling around for solutions that have worked for people (usually involving reinstalling GFWL Marketplace) should get you going without too much trouble.